Did medical researchers really conduct a study to determine whether mother's kisses of children's boo-boos had any therapeutic value? When a mother sees her child injured and crying, it's common for her to offer kisses to "make it better." But do these kisses work? Do they actually benefit the child? That was the question posed in a curious article that appeared in the December 2015 issue of the Journal of Evaluation in Clinical Practice. The authors of the article declared their intention was to examine "the efficacy, if any, of maternal kissing of boo-boos in toddlers." To do this, they conducted a "ramdomized, controlled and double-blinded study of children with experimentally induced minor injuries." The authors wrote that they recruited 943 mother-child pairs to participate in the study. The children were then put in a situation where they would experience either a head or a hand "boo-boo." Hand boo-boos were induced by placing a favourite object (lovey) of the child just out of reach on a counter behind a heated coil. Attempts to obtain the lovey would result in a noxious thermal stimulus to the fingertips. The coil was heated to 50 degrees Celsius (120 F) in order to produce a significant but non-damaging stimulus. After experiencing the boo-boo, the children were directed to place the injured body part "into an appropriately sized aperture in an opaque screen." One of three things then happened: 1) The injured part was kissed by the mother, 2) it was kissed by a trained researcher "free of oral ulcers," or 3) the child received no kiss at all. If the child received a kiss, he/she didn't know the identity of the kisser because of the opaque screen. The researchers then carefully documented the results, which revealed that there was "no value to maternal kisses compared to sham kisses in alleviating the distress of toddlers with boo-boos." The authors concluded, "maternal kissing of boo-boos is a common practice that appears to have no ability to reduce the distress of toddlers and may have significant untoward effects. On the basis of this study, we recommend a moratorium on the practice." The article is very odd. Banging toddlers on the head and burning their hands sounds more like child abuse than legitimate science. Surely the authors aren't serious about having done this? And yet, the Journal of Evaluation in Clinical Practice is a serious publication, not a humor magazine. Launched in 1995, the journal describes itself as "a high quality international scholarly journal which is concerned with the evaluation and development of clinical practice across medicine, nursing and the allied health professions." Nor is the article labeled in any way as satire. It appears alongside obviously serious articles, such as one about "Elderly patients hospitalized in the ICU in France." All of this might lead a reader to conclude that the maternal-kissing article describes a real study. However, it doesn't. The article contains a number of clues indicating that it's satire (in addition to the absurdity of the topic itself). For instance, the authors claim their study was funded by Proctor and Johnson, the manufacturer of Bac-Be-Gone ointment and Steri-Aids self-adhesive bandages. Neither this company nor its products exist. The authors describe themselves as members of the "Study of Maternal and Child Kissing (SMACK) Working Group." Again, there is no such group. Kuentz, S. (2008) So what the hell is going on here? (Editorial). Pediatrics, 204 (4), 516–519. Lihnhamer, B. D. (2010) Reading Barney books, changing diapers, wiping snot and other disgusting things: what’s in it for moms? Parenting Today, 47, 78–84. 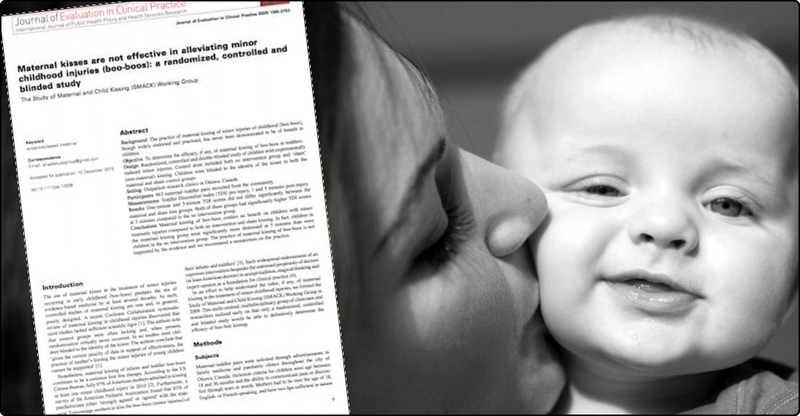 Given that the maternal-kissing study is completely fake, how did the article about it end up in a scholarly journal? Did someone con the editors of the journal? That was the suspicion of some readers, such as the editors of Federalist magazine. However, Dr. Andrew Miles, the editor of the Journal of Evaluation in Clinical Practice, later clarified the situation in an email he sent to the Federalist, revealing that he was quite aware the article was fake when he accepted it, and that it was intended as an end-of-year spoof, belonging in the long tradition of scientific humor. He explained that the article satirized arguments made by some proponents of "evidence-based medicine," and he also identified the true author of the article as Dr. Mark Tonelli of the University of Washington in Seattle.